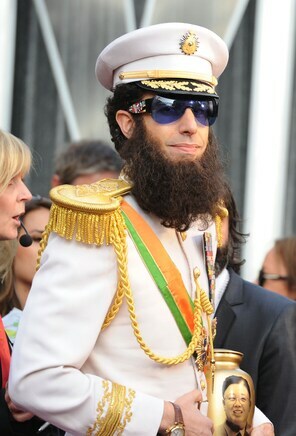 Sacha Baron Cohen stole the show, in my opinion, plugging The Dictator in costume. No surprise there! A few hours after the photo below was taken, Samantha Murphy on Mashable Entertainment writes about his “shenanigans.” The actor and comedian dumped the fake ashes of Kim Jong Il onto Ryan Seacrest… here’s Murphy’s piece. Coverage from The New Yorker throughout the year of Best Picture nominees; Archive. By 9:30 p.m., 3 book-based films had won an award. Bonus from 2011’s ceremony: CollegeHumor’s “Top Ten ‘James Franco Is Stoned’ Oscar Moments”; video. Bon Appetit’s food blog Friday had some great entries: the Titantic’s final lunch menu is up for auction and expected to fetch 100,000 pounds, a 27-pound lobster was found and released of the coast of Maine, and astronauts, theoretically, crave spicy foods due to a compromised sense of smell. Here’s the Telegraph piece on the menu auction, and here’s the MSNBC article on the huge lobster. Find the other selections and links in BA‘s blog post. Political pamphlets, serial-style novels… what other tricks of the publishing trade are ebook marketers using to get readers interested and keep them there? Here’s the piece by Benedicte Page. Here’s the article on CNN. You’ll be amazed and impressed and the number of examples Christophe Courtois has found for each of his categories. Among them? Large faces above small figures on a beach, people lying in bed, and a stark blue background with an image, often a silhouette, in the foreground of the poster. From 22 Words: List, with numerous examples. From io9.com, “Survival Books to keep on your bookshelf in case of the apocalypse”; here’s the list. Drooling. Seriously. Recipe (click if you dare).